Sinead O’Hart’s debut novel tells the story of Emmeline Widget, a girl who has never left her house. Until the day comes when her scientist parents disappear, and she is packed off to a safe house in Paris by boat. 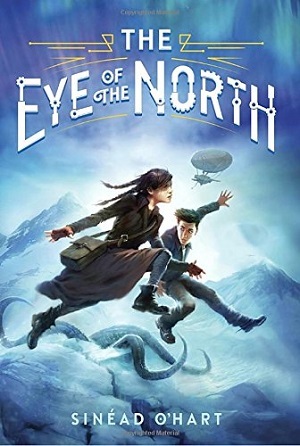 But before the ship arrives, she is kidnapped by the evil Dr Bauer, and it becomes apparent that she is headed in the same direction as her parents – to the far north and the deep ice, within which a legendary monster dwells. But why does Dr Bauer want to unleash the monster? Who is the Northwitch? And why will Thing help her under any circumstances? This dazzling, icy fantasy is magnificent in scale, hugely ambitious, and magical at the same time. Here, Sinead O’Hart, who can read Middle English with perfect fluency, explores her inspirational childhood books (they’re all in modern English). I read Alan Garner’s Elidor when I was eight, and it changed my life. It’s a book about family, about love, and about the threat of all you treasure being lost; it’s a book about another world seeping into the ‘real’ world, and how unsettling that can be. It features magic, mythology, sacrifice, and absolute bravery in the face of terrible odds – and it’s a book I still read at least once a year, because I always learn something new from it every time I read it. Antoine de Saint-Exupery’s The Little Prince is another book which I adore. Partly a fable, partly a story about the frightening reality of being trapped in a desert without hope of rescue, and mostly a story about love that transcends space and time, it’s a classic that everyone should read. Orla Melling’s The Singing Stone is a book I read as a young teenager, and it meant a huge amount to me both then and now. It is a children’s book, but there aren’t any children in it; all the characters are teenagers or young adults. Somehow, that didn’t matter to me at all. A young woman travels from Canada to Ireland to find out who she is and where she comes from; a story which links her to the Tuatha de Danaan, the old gods of Ireland, ensues. It’s a magical, dreamlike tale which fed into my love of mythology and folklore. Pat O’Shea’s The Hounds of the Morrigan is a book I first read when I was eleven, and I can read it with as much joy now as I did then. It’s about Pidge, his sister Brigit, and a ragtaggle cast of characters who seek to save Ireland, and the world, from the terrible power of Morrigan, the Great Queen, the three-faced Battle Goddess of Irish mythology. It’s brilliant. It’s hilarious. It’s also genuinely nail-bitingly scary in places. It’s one of the most important stories in the world to me. And Madeleine l’Engle’s A Wrinkle In Time is a book that captivated me when I was nine or ten. It sweeps from our universe to another; it takes in complicated ideas from science and astrophysics and somehow makes them seem perfectly simple; it has a very clever girl at its heart. It’s also about the power of love, and how that’s the most important force in existence. With thanks to Sinead for her thoughts. To buy a copy of Sinead O’Hart’s debut book, click here.